The problem here is that the servers are arranged by name and not be IP address. The solution, therefore, is as simple as it sounds: arrange the servers by IP address. This doesn't mean we remove the name hierarchy, or duplicate all the servers, or anything silly like that. Instead, we create an additional, numerical hierarchy that coexists with the name hierarchy. We then use this to find names from numbers, using a process commonly called reverse name resolution. The name hierarchy for the Internet is implemented using a special domain called IN-ADDR.ARPA, located within the reserved .ARPA top-level domain (IN-ADDR stands for INternet ADDRess. Recall that .ARPA was originally used to transition old Internet hosts to DNS, and is now used by the folks that run the Internet for various purposes. At the first level within IN-ADDR.ARPA there are 256 subdomains called 0, 1, 2 and so on, up to 255. For example, 191.IN-ADDR.ARPA. (Actually there may not be all 256 of these since some IP addresses are reserved, but let's ignore that for now). Within each of the subdomains above, there are 256 further subdomains at the second level, numbered the same way. So for example, one of these would be 27.191.IN-ADDR.ARPA. Finally, there are 256 subdomains at the fourth level within each of the third-level subdomains, such as 8.203.27.191.IN-ADDR.ARPA. The special IN-ADDR.ARPA hierarchy was created to allow easy reverse lookups of DNS names. IN-ADDR.ARPA contains 256 subdomains numbered 0 to 255, each of which has 256 subdomains numbered 0 to 255, and so forth, down four levels. Thus, each IP address is represented in the hierarchy. 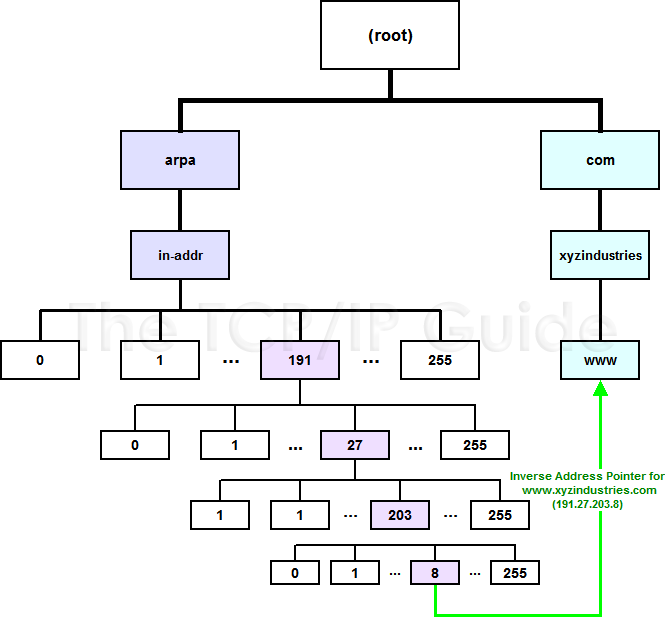 In this diagram I have shown as an example the DNS domain name www.xyzindustries.com. It would have a conventional resource record pointing to its IP address, 191.27.203.8, as well as a reverse resolution record at 8.203.27.191.IN-ADDR.ARPA, pointing to the domain name www.xyzindustries.com.